To survive, plants, animals and birds confronted with climate change have two options: move or adapt. With the speed of climate change we are experiencing already, it’s often not possible for a species to adapt quickly enough to keep up with its changing environment. And with the amount of habitat destruction, dam building, roads and cities expanding, moving is becoming increasingly difficult. In such cases, climate change can mean that species disappear in places where they once thrived, or even go completely extinct. A recent study in Science found that one in six species is at risk of extinction because of climate change – if we do nothing about it. Climate change is clearly one of the biggest threats to the natural world. This is true in its own right but also because climate change can amplify existing threats. This stark truth was captured dramatically in the winning image taken by the 2015 Wildlife Photographer of the Year. It’s an illustration of the deadly competition that can happen when animals move into new ranges. In this case, Arctic foxes are being displaced by red foxes in the Canadian tundra as the northern climate warms. The red fox's range is expanding, and the smaller Arctic fox, naturally a predator, has become prey. Many species are moving from their traditional ranges in response to climate change, finding different “niches” where they can live and successfully reproduce. 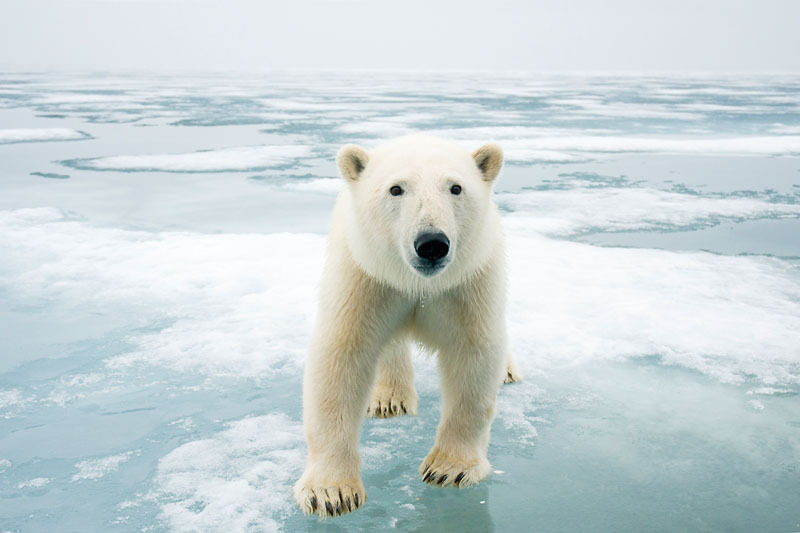 In a warming world, species generally shift towards the north and south poles, or up-hill; sea creatures often move deeper into the ocean, following the temperatures they can survive in. Some species, such as the red fox, find that previously inhospitable environments have become suitable for them, while others will be pushed into smaller and smaller habitats, or displaced altogether. Sights like that seen in ‘A tale of two foxes’ are rare at the moment, but they may become more common as the Arctic warms. For many species in the Antarctic and Arctic, where warming is at its most rapid, and those atop mountains, or in remaining patches of forest, there may be nowhere to go. Where people are involved – where natural habitats are broken up or dominated by cities and agriculture – it can be almost impossible for species to find new homes. On 23 October, international snow leopard day, WWF highlighted potential impacts of climate change on snow leopard habitat. Snow leopards live in regions of Central Asia and the Himalayas, usually at elevations of 3,000 to 4,500 metres in some of the harshest habitats in the world. High elevations in the Himalayas have already seen warming at three times more the global average and much of their current habitats could become unsuitable for them if more is not done to address climate change. It’s a story that has echoes all over the world as this new report from WWF highlights – for orang-utans, blue whales, tigers, African elephants, green turtles… the list goes on. Climate change is one of our biggest challenges at WWF. It’s our mission to stop the degradation of our planet’s natural environment, and build a future in which humans live in harmony with nature. That’s why we’re working hard to influence world leaders and negotiators as they prepare for December’s UN climate summit in Paris. We all need a global climate change agreement that’s fair, ambitious and transformational. Developed countries will have to agree to make big cuts to their greenhouse gas emissions. Every country will have to reduce their reliance on fossil fuels and move to clean renewable energy such as wind and solar power. If the outcome from Paris can set us on a path to limit future emissions that can keep global temperature rise to well below 2oC or 1.5oC, as well as fund projects to help the most vulnerable adapt, we can avoid the worst impacts of climate change. The fact remains, whatever the outcome from the Paris summit, that climate change is one of the biggest threats to the natural world. World leaders must catch up with cities, businesses, faith groups and banks who are already taking real action to tackle climate change. We all need to encourage our leaders to come to the agreement that the world needs – to reduce our carbon emissions and protect the most vulnerable people and species. WWF supporters across the world will be joining international demonstrations on 29 November to send a clear message to our governments that we expect them to deliver in Paris. If you can, why don’t you join them?